"Focus on food, this is the last thing that people can do without". This quote from Gerrit Johan Kramp, the founder of today's Kramp Group, reflects our position of being constantly guided by demand and needs. It also explains our customer-focussed philosophy. We think ahead, act in a target-oriented manner, get involved — and develop solutions that meet the requirements of modern agricultural technology companies. Fast, easy, future-oriented. Our customers appreciate this focus. It has been one of the factors behind our success. From a 27 sq. metre bicycle shed, Kramp has developed over the past decades into a dynamic, expanding e-business company. It is now Europe's leading agricultural equipment wholesaler. Under the Kramp and Grene banner, it has a presence in the agricultural machinery, forestry and grasscare, construction equipment and OEM markets. Isn't agriculture conservative? On the contrary. Whereas the previous generation of specialist dealers had to rely on catalogues and the telephone to order the products they needed, today the Internet and smartphones have become fixtures. Shopping patterns are changing but the traditional concept of service remains. Order any time, anywhere, easily. We listen closely to what our customers need, we offer you innovative e-commerce solutions that drive their business forward — whether for PC, tablet or smartphone. Back in the day, it was our comprehensive product catalogue that impressed our customers. Today we stand out from the crown thanks to our scan-to-mobile, EDI, and cylinder configurator solutions. What is more, we’re already working on the ideas of tomorrow, because the future has already begun. 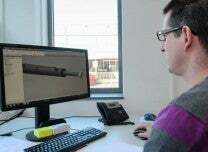 Although the Kramp group is now active throughout Europe, close contact with the customer is hugely important. "Think global, act local" expresses our focus. Based on a deep conviction, we maintain sustainable and long-term partnerships with our customers and suppliers. This principle is shared by the Danish company Grene, which merged with the Kramp Group in 2013. Through the merger, Kramp has been able to significantly expand its market position in Europe as well as its range of spare parts and components. Kramp and Grene are family businesses, which deliberately maintain their traditions while continuing to evolve. Our values—customer focus, commitment, entrepreneurial spirit and cooperation—are incorporated into our daily contact with our customers, as well as into our mutual cooperation. This is what makes the Kramp Group what it is today. This is what makes us strong. This is why we are so much more than just a wholesaler. In addition to a complete spare parts service, we offer our customers an overall concept consisting of intelligent service solutions, professional advice and partnership. Our customers deserve it!